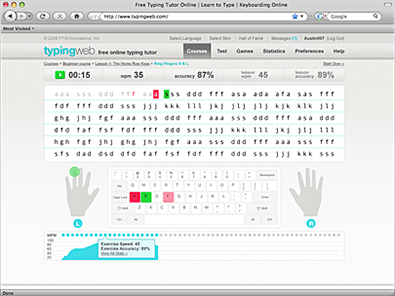 I reviewed three popular typing website for the use of elementary schools. I found that some websites were extremely helpful while others were not. All of the sites had both good and bad qualities. Pros: This website features fun interactive characters who sing and talk. This can make learning to type, normally a very drab task, more enjoyable. The songs and dialogue also relate to typing so that a child can learn to type while listening to the music. In my opinion, the sections of text the game asks the child to type are very useful. First, the child is asked to type the letters in the area they are learning in seemingly random patterns. Then they are asked to type out words that can be spelled with these letters. This helps ideas flow better so the typing is not always very interrupted and boring. Cons: The website is very immature. Some of the older elementary schools students might not respond well to it. A six year old and a ten year old often play with different toys, watch different movies, and are entertained by different things. I think this would be perceived as too babyish for third or fourth graders. In addition the website has long musical sequences which can engage a child but may also be too long. Some of the shorter musical interruptions were welcomed yet the constant interruption was very bothersome and distracting. Summary: I believe that this website is very beneficial for the first and second graders;however, I do not think it would be for third or fourth graders. I believe that using this website for the younger kids and one of the others for the older kids would be a smart decision. Pros: This website was my favorite of the three. It features a paid and free version for schools. The cost of the paid version would vary based on the number of teachers and students using it per year. It would give teachers the ability to monitor each student’s progress and create lessons for the year. The website’s features include locking levels so students may not skip through the course and monitoring if a child is not actually completing a lesson. Each level requires that students must score a certain percentage and if they do not the level must be repeated. This prevents cheating. The website itself is also very streamlined allowing for easy navigation and access. This website also features the ability to type in both words and randomized letters based on what level the student is on. The instructions are given in the form of a pop up which can be called back at any time in the lesson. The “help” button in the upper right corner can help students as questions arise. Cons: Sections of text can be skipped by holding down a single key. However, if a student scored below a certain percentage he/she is forced to type the text again instead of moving to the next level. The cost of the program with all the features is very high though free accounts that cannot be monitored by an administrator are available. Summary: I saw very few problems with this website other than the price. This was my favorite website because it was not distracting or dull. It also has the option of giving teachers the ability to monitor their students’ progress which is a very helpful feature. I strongly recommend the use of this website. Pros: The website offers very well worded explanations for each part of the course. The course also covers a lot of material allowing for the continuation of the course until one has become very skilled at typing. 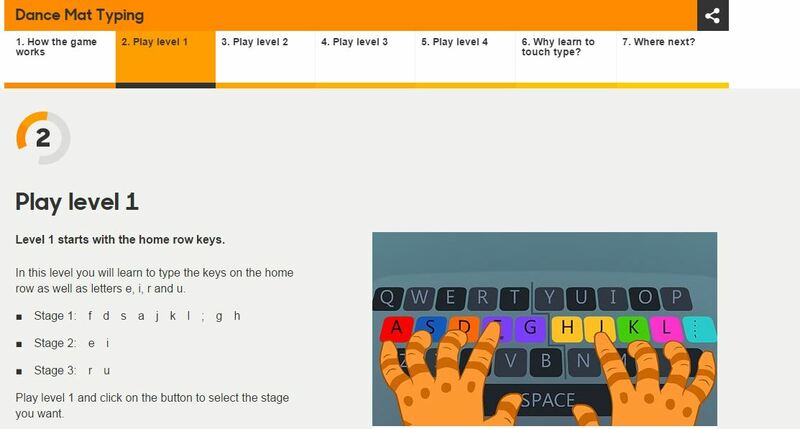 It also features games which could make learning to touch type much more enjoyable. The website itself was very simple to navigate. Cons: The website has distracting ads along the borders of the sight. It also has a confusing method of preventing cheating. It will not allow you to type the same wrong letter twice in a row so it stops moving. This means that if it stops and you are not prepared (which happened to me a few times while testing the website) it will severely harm your scores. Once the instructions were given they could not be called upon again during the lesson. One could also do any levels and skip the levels they must complete. Summary: This website was mediocre at best, in my opinion. The ads were distracting and the typing itself was very difficult because of its attempt to prevent cheating. The website was not aesthetically pleasing and one could access all levels. 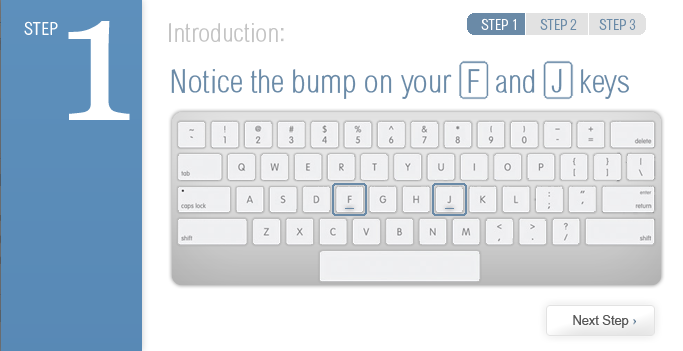 This was my least favorite of the websites and I strongly suggest not using typing.com to teach anyone to touch type. In conclusion my recommendation is using BBC Bitesize Dance Mat Typing for the first and second graders and Typing Club for third and fourth graders. Both websites are streamlined , easy to use and have very well thought out features.